Temperatures for the start of the week will continue to be cool, but there is some relief in sight with above normal temperatures possible by the end of the week. Monday morning is starting with temperatures in the teens and low 20s once again. High pressure is overhead, but a disturbance will ride along the jet stream to our south, keeping skies rather cloudy and temperatures cool. A few flurries may even work into the region from the southwest during the afternoon in association with that disturbance. The best chance for snow will be across the Southern Tier, but accumulations should be limited to a dusting. Temperatures today will top out near 40 degrees, which is an improvement over the weekend, but still 10-15 degrees below normal. Winds will be quite light for a change, thanks to the high pressure system overhead. Tuesday will start with more clouds than sun, but by the afternoon, skies should turn mostly sunny. Northwest winds during the day will be a little breezy, but not as strong as they were over the weekend. Look for high temperatures Tuesday to be similar to Monday thanks to the northwest winds, with highs around 40 degrees. Clouds will increase Wednesday into Thursday as two more disturbances bring some rain showers. More importantly, however, will be the start of an upward trend in temperature. Highs on Wednesday will only be a little bit warmer with mid 40s expected, but south winds will kick in on Thursday, sending temperatures to near-normal levels in the mid 50s. Your support is needed! Please click the banner above to learn more about how you can help! Things will start to get interesting late in the week and into the weekend. A large, powerful storm system will develop over the Plains and will track northeast towards the Great Lakes. A classic severe weather outbreak looks possible across parts of the Plains and into the Mississippi, Tennessee, and Ohio valleys. Here in the Finger Lakes, a warm front will extend from west to east somewhere in our vicinity. This will be an extremely sharp front, with temperatures in the 30s and 40s to the north and 60s and 70s to the south. At this early stage, it is impossible to say which side of the front we will end up on, but I am cautiously optimistic that we will get into the warm air for at least some period of time. Unsurprisingly, there is a large spread of possibilities for the weather Friday, Saturday, and Sunday. In addition to the questions over temperature will be the potential for strong winds, rain, and possibly even some thunder of our own. Stay tuned throughout the week, and watch out for hype. Undoubtedly, the prospect of 70s will be a tantalizing topic and the very real possibility of ending up on the cold side of the front will likely be ignored. For the next few days, I will be asking for your financial support for Finger Lakes Weather. This fund drive, my first organized fundraising effort in over two years, is vital to the success and future of Finger Lakes Weather. Your support and partnership are extremely important! 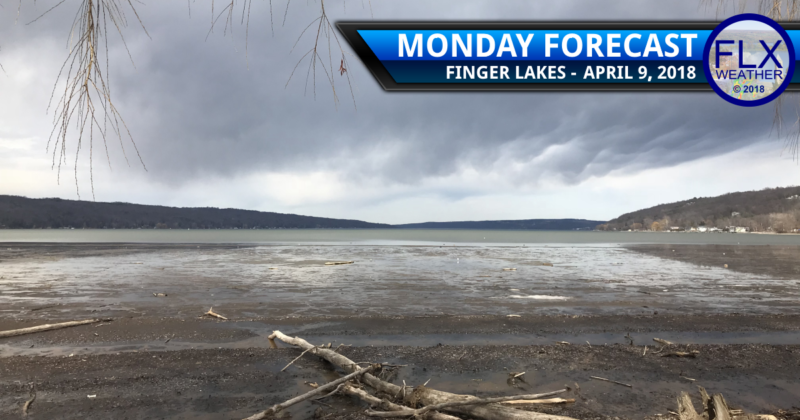 Please visit the Fund Drive page and seriously consider how you can help ensure Finger Lakes Weather continues and thrives. Also, as part of this Fund Drive, I will be hosting live video sessions tonight, Tuesday night, and Wednesday night at 7 pm. These streams will be hosted on Facebook but will be embedded here on Finger Lakes Weather. Tonight, I tell my personal story, going from a young boy obsessed with the weather to a meteorologist with multiple college degrees. I’ll also take a look into the future and describe some of the things I hope to accomplish with a successful fund drive.